Bryony Knox designs sculptures and silverware with a twist, creating pieces which, on closer inspection or handling reveal an additional function. Interaction and discovery of unexpected movement, or flashes of colour and texture, inspire Bryony, bringing to life the wonderful characters and creatures of myth and fable. Recent inspiration comes from antique Playing Cards, fifteenth century Dutch drinking games and sacred and mythical animals. 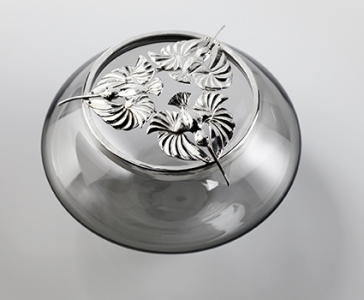 From elegant decanters to boxes with secrets, each individual piece of Bryony’s work is fashioned and embellished using the techniques of repousse and chasing, often with enamel or gilded details. Knox has work in private and public collections including Winchester Cathedral and The Worshipful Company of Ironmongers.